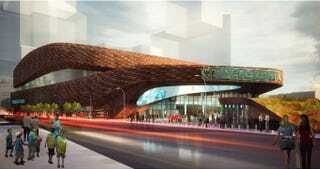 Russia's Kontinental Hockey League announced today it would play two regular-season games next winter at the Barclays Center in Brooklyn, the brand-new palace of eccentric Russian billionaire and failed politician Mikhail Prokhorov, and his Brooklyn Nets. KHL president Alexander Medvedev first announced the plan to invade American soil back in March and received the blessing of both the NHL and NHLPA, who, according to Medvedev, "promised that they won't oppose [having KHL games in Brooklyn]." The participants for the two games haven't been finalized yet, but the league has narrowed the list down to five candidates: CSKA Moscow, Dynamo Moscow (the 2012 KHL champion), Avangard Omsk (Jaromir Jagr's former team), Salavat Yulaev and SKA St. Petersburg. The Barclays Center—which had already scheduled the Islanders and Devils for a preseason game in September—will have a capacity of 14,500 for hockey. That's a lot of seats to fill for two games between teams from halfway across the world (or for an Islanders game, for that matter), but Medvedev is confident the arena will be full. "I am sure these games will be sold out," he said. The KHL trusts the large number of Russian immigrants in Brighton Beach and Sheepshead Bay will come out for a taste of the KHL's inferior flavor of hockey. The larger question is whether regular-season pro (if third-rate) hockey can whet the appetites of potential fans in Brooklyn and eventually lead to the Islanders ditching their dump on Long Island to set up shop at the Barclays Center full-time. The Isles need a new home, but is the KHL really enticing enough to create the necessary interest in Brooklyn? Probably nyet.